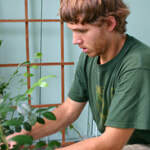 ​The Silent Seed was founded by Jude Haverington who is profoundly deaf and passionate about plants. He collects and grows rare and exotic plants from all over the world. re-used materials, and no chemicals. In 2008, The Silent Seed made its debut as a storefront in Magnolia, MA and then returned to its original roots in Newburyport, MA in 2011.